This month I’ve been on a slow down mission…and, I think I’m finally getting it. I haven’t managed to sit quietly meditating every day, but I have done it every couple of days. And I have been trying to move slower, to say “no” to too many commitments, to sit with a cup of tea and read my book more often. As my Headspace App tells me, calm in your mind is like a beautiful blue sky…sometimes it is covered with clouds (aka your thoughts), but the blue sky is always there underneath it…you just need to let the clouds pass. However, as I slowed down, an interesting thing happened. I got more stressed and anxious. The clouds weren’t passing, they were brewing a storm. What? No?!? The whole point of this was to feel calmer, not feel worse! Not that there is anything particularly unnerving to be found ( I don’t think!? ), but I suppose just acknowledgement that maybe I have taken on too much which is swiftly followed by a slight (ok overwhelming) panic that I’m not sure which piece of my puzzle isn’t fitting right or how to fix it (yep…there she is, Claire the Control Freak comes out to play). And not surprisingly, yet again, I hit another wall. Another melt down. I’ll spare you the details (but I’ll give you a hint, the children were involved). It just so happened, though, that I already had a plan in place to have a weekend away with some girlfriends. I have to admit I wasn’t sure I was going to be good company. But the idea of having a break away from the every day seemed blissful. And I was right… It was like a circuit breaker for the all the thoughts going around in my head. Now, I was really able to slow down. And when I slowed, instead of panic, the gaps were filled with laughter, music and just a quiet calm. 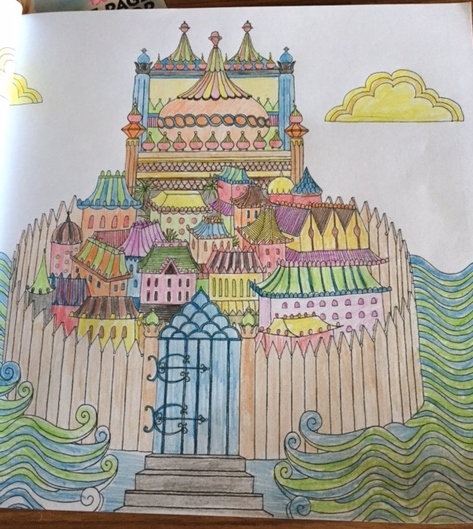 My sister bought me one of those mindfulness adult colouring in books for my birthday (I hear they are really hot right now, good to know I’m totally on trend)…and I found myself on Sat afternoon sitting by the fire, colouring the pages, with a glass of wine and good company. And it felt awesome! I think I kinda expected that the moment I started to slow down, I would feel instantly amazeballs and on top of things (because clearly I am amazeballs, I just feel like I have lost that person a little bit in all the chaos). However, maybe you need to be a little bit more patient (something I am not). Maybe, it takes longer than you think for your mind to start to slow…and it gets a little worse before it gets better? I know I still have a long way to go, but I finally feel like I am heading in the right direction.